Music Conservatory of Westchester of White Plains is giving Westchester County families a chance to experience their bilingual (English and Spanish) early childhood music education program, First Notes/Primeras Notas, for free. 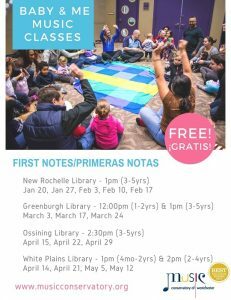 First Notes/Primeras Notas music classes will be held at libraries in New Rochelle, Greenburgh, Ossining, and White Plains during early afternoon hours, providing a total of 22 classes starting January 20 through May 12, 2018. In this Library Lesson Series, the classes will be organized by age: 4 months through 5 years. The schedule is outlined below. This new free Library Lesson Series from the Music Conservatory of Westchester is introducing Westchester County families to a sample of the range of music education programs that the community music school teaches regularly at its 36,000 sq. ft. facility to students of all ages, including First Notes/Primeras Notas. The Conservatory is also hosting free, educational performances at local public libraries and plans to expand the Library Lesson Series throughout 2018. Taught by Music Conservatory of Westchester teacher and certified Music Together instructor Sandra Muñoz, First Notes/Primeras Notas classes are an introduction to music geared toward jump starting early childhood education for babies, toddlers, and preschoolers through songs, sound exploration, rhythm and movement in an upbeat, nurturing environment. Children attend classes with a parent or caregiver, sharing the joy of singing and experiencing music together, in two languages. Parents who speak any language are encouraged to join the class with their child. Parents and their children will experience a sample of the quality music education provided at the Music Conservatory of Westchester for students of any age from four months to 80+ years. To continue the First Notes/Primeras Notas program beyond the Library Lesson Series, the Music Conservatory of Westchester encourages signing up for its young children’s programs: First Notes/Primeras Notas, Music Skills classes for children from Pre-K through Grades 2-3, a Piano Program, and Suzuki Program, all taking place as regularly scheduled classes at the Conservatory’s White Plains location with scholarships available for affordable tuition. For more information about the Music Conservatory of Westchester’s Library Lesson Series and other offered music classes, call 914-761-3900 or visit www.musicconservatory.org. For more information about this program and/or the Music Conservatory of Westchester, please contact Adriana Rivera, Communications and Development Assistant, at [email protected] or 914-761-3900 x135.